Wood framed buildings are under attack all around the USA we are all wondering who is lighting these buildings on fire. Our builders are getting slammed by risk management premiums escalating as everyone is wondering who is next as we lose a project per month sometimes two. An under-construction University of Arizona student housing building sustained major damage; 30 evacuated from nearby apartment complex. 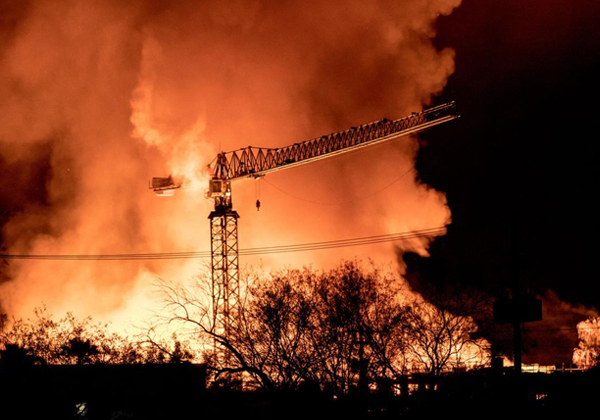 TUCSON, AZ — An overnight fire in Tucson burned so hotly that two construction cranes melted, fire officials said Tuesday. The two-alarm fire at a construction site on East Broadway Boulevard just south of the University of Arizona campus caused more than $1 million damage. Major portions of a multi-story student housing building still under construction were destroyed in the blaze, which broke out around 2 a.m. No one was injured, but about 30 people in the area were evacuated and are being assisted by the Red Cross, the Tucson Fire Department said. "Heat from the fire was so intense that nearby buildings, specifically a smaller set of apartments across the street, were evacuated due to concern they would ignite," the fire department said in a news release. "Quick action from firefighting crews prevented the fire from destroying the apartment building."